I announced HERE that I am in the process of writing my next book. It will be a book that is addressed to high school students, and I am sharing 12 Things I Wish I Had Learned About Money Before I Hit The Real World. That is not necessarily the title, and it might end up being 10 things or 15 things. All I know is that I want (and need) your help in writing this book! For the next five days, I am going to ask you to take a couple minutes of your time and share some things you wish you would have learned about specific money topics. 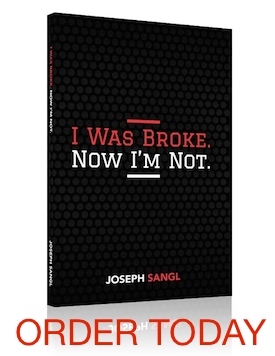 There will be two ways for you to share your idea – in the comments or by clicking "E-mail Joe" at the top of the sidebar here at JosephSangl.com. What is the worst financial decision you have ever made? What led to that decision? How would you teach young people to avoid that type of decision? Share stories! Getting caught in the payday loans / title loans. The reason I turned to these options was the result of many other “little” bad decisions. (Not keeping my check book register, which caused overdrafts. Going out to eat lunch / dinner on an almost daily basis due to lack of preparation/planning. Not putting extra money that I got (bonuses, Overtime, etc) into savings rather than go and blow it on a big “want” purchase. We should have been able to afford our monthly mortgage based on our salaries, but due to poor financial decisions that we made, we nearly lost it several times. The worst financial decision was buying the “cool” car and not the “smart” car. Make sure you are buying a car for the right reason. I got caught up what I wanted and not what I needed. There is usually a big difference in the two, especially price. How timely Joe! I just dropped an article on this topic a couple days ago! I bought a used Harley with a Credit Card cash advance…argh, it hurts to say it out loud but it really happened. The good news is that I’ve since paid it off and I still very much love riding the bike. The ironic thing is that I bought it this way because it was a pretty good deal – the original price anyways – and I rationalized that I’d never be able to pay cash given the other debts I was paying at the time…hmm, so why not reward myself with even more debt. Dumb thinking and certainly a lesson I’ve learned. Thanks again for allowing me to contribute! Take my advice and do what my younger brother did…He took less than a quarter of my down payment and bought a used truck that he ended up keeping longer than I kept mine. As you get older you start to care less about how your ride looks and start to consider the impact it will have on your budget. Before my wife and I were married, we attended a bridal show and were “chosen” to attend a dinner. It turned out to be a sales dinner for some fancy pots and pans. We were stupidly suckered into buying $1700 worth of cookware because they made it sound soooo good. They also offered a “travel certificate” which was a big draw for us bu it ended up being nearly impossible to use. If the pot has to be sweetened, what’s in the pot might not be so good. There already is a High School Money Book. It’s by Don Silver. The biggest error I made was not getting to the same page as my spouse. I was always more concerned about finances. She had come from a more well to do family that used leverage and other methods I never understood. Their opinion, as was hers, was any problem could be resolved through sheer will and that I was worried too much. By not finding common ground, we were on a path to financial problems. The path became one piece of larger marital problems that didn’t have a positive outcome. My biggest mistake was falling into the trap of “I can make the payment” way of thinking. I now have 2 car payments that we are working to pay off. I should’ve been thinking “I can save that payment” instead. Used cars are the way to go… without a doubt. Nothing new about new cars except new, higher payments! Keep up the good work. there walking around with my $300.00. Shortly after that my lesson was learned….if it sounds too good to be true, IT PROBABLY IS!!! Hang onto your $300.00 for a rainy day or better yet, invest it using the IWBNIN approach.